Acacia # 11, A.F. & A.M. In order to complete this historical account which attempts to summarize the life and actions of Acacia # 11 from the date of its conception in the minds of a few brethren to this, its hundredth anniversary, it was necessary to examine and digest all the ancient material that was available - Historical Registers, Minute Books and Account Books just to name a few. Undoubtedly there are many items of differing importance, which the compiler overlooked when selecting this material for inclusion for which exclusion his apologies are extended. Two fact primarily impressed the compiler as they prepared this chronological list of events: the first can best be defined in these words; "the present is reflected in the past" - matters which disturbed the brethren in varying degrees in the past are still disturbing the brethren of today in varying degrees. The second was the strength, determination and perseverance exhibited by our early brethren - expressions of their loyalty, both to the craft and to the Lodge and their complete disregard for negative thinking are manifested between the covers of the various references used by the compiler. As one prepares this material a third impression is formed which could be more important than those previously mentioned - there is more history, more life, more enjoyable times and more struggles and adversities not represented by the written accounts than has been passed on to use today. The Masonic Lodge has always prided itself on the founding principle of taking good men and making them better The list of good men who have ranged themselves under the Masonic banner is long and added to that list is the group of men who are both great and famous. We take much pride in naming the Canadian Prime Ministers and the British Monarchs who have been members of the craft. In the United States of America, presidents, senators and astronauts are remembered. The Masonic Lodge has been enriched with variety in its membership ranging from John Diefenbaker to Mozart to Walt Disney. We in Acacia Lodge can be proud of a heritage which has included mayors, fire chiefs, politicians, milkmen and judges. Among our members, however, none have been more prominent than a young gentleman from the town of Strathcona, Alexander Cameron Rutherford. 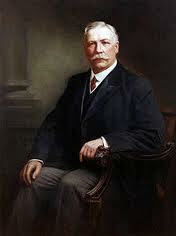 Much has been written and is known about A.C. Rutherford. He was, of course, a highly successful businessman, lawyer, property developer and politician. He served as the first Premier of the Province of Alberta and as Chancellor of the University of Alberta, an institution which he was very instrumental in founding. He was, as well, a founding member and the first Worshipful Master of Acacia Lodge #66 under the Grand Registry of Manitoba which, in 1905, became Acacia Lodge #11 under the newly formed Grand Lodge of Alberta. Although his successes and contributions to Alberta are well documented, what about the origin of this great man who was to mean so much to our city, province and, of course, Masonry in the old town of Strathcona. His parents, James Rutherford and Elizabeth Cameron, met and were married in a rural farming area near Perth Scotland. In 1855, the Rutherford family, which then included four children, emigrated to the new world and settled on what was to become a prosperous dairy farm near the village of Ormand, Carleton County, Canada West. The village was located just a few miles south of Ottawa, a settlement which some years later was to become the capital city of the Dominion of Canada. On February 2nd, 1857, James and Elizabeth Rutherford celebrated the birth of their fifth child, the first to be born in Canada. It was a boy whom they named Alexander Cameron. Little did they know that nearly one hundred and fifty years later and some 5000 km. to the west, this group of men would be remembering the birth of their infant son. As a child, Alex attended the local public school in Ormand, then, in a move unusual for the times, he did not continue with the family tradition of dairy farming but rather took the major step of furthering his education as he chose to attend High School in the town of Metcalf nearly 20 miles away. He completed his High School education in the spring of 1874 and after one last summer on the family farm, he enrolled in a small Baptist College in the rural community of Woodstock, just south of Hamilton, to begin studies for the ministry. This was a two year program and when he received his diploma in 1876, he chose not to enter the service of the church but instead, took a teaching position in the public school system for one year. The fall of 1876 saw A.C. Rutherford back in the classroom this time as an undergraduate student at McGill University in the growing city of Montreal. Four years later, in 1881, he graduated with degrees in both Liberal Arts and Civil Law. He returned to the Ottawa area that summer and immediately entered articles with a local law firm. Years later, his children would recall that he often looked back on his years as both a student and during articles as the most enjoyable of his life. In 1885, at the age of 28, he was called to the Ontario bar and for the next ten years, was a partner in the firm of Hodgins, Kidd and Rutherford for whom he managed the growing office in Kentville, Ontario just south of the nation's capital and only a few miles from the place of his birth. During this period, he met a young lady by the name of Matti, the daughter of William and Elizabeth Berett. In December of 1888, they were married and in 1890, their first child was born a son whom they named Cecil Alexander Cameron Rutherford. In 1893, Cecil welcomed a sister Hazel Elizabeth Rutherford. A.C. Rutherford was well on his way to success. His law practice was flourishing, his family was young and healthy and they were gaining wealth and social prominence in the Ottawa area. It was during this period that he petitioned and was accepted into the Masonic Lodge in Kentville. He immediately became active in the Lodge. With his life going so well, what more could he have wanted? These were busy and happy times for the Rutherford's but apparently, Alexander Rutherford was not satisfied. We will never know what interested him in the development of the Northwest Territories but whatever it was, it has had an effect on each one of us here today. 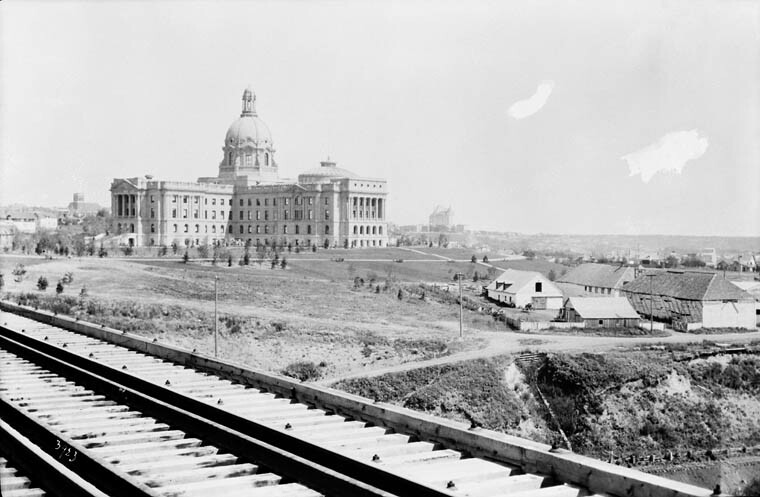 In 1894, he made a solo trip west on the Canadian Pacific Railway to the boom town of Calgary and from there he took the newly opened C & E (Calgary and Edmonton) branch line north to the railhead on the southern shore of the North Saskatchewan River just across from old Fort Edmonton. His arrival was noted in an August 2nd article in the Edmonton Bulletin. Apparently, Alexander liked what he saw on this brief visit as he immediately returned to Ottawa and informed his wife that she and their two young children were to accompany him early the following year in a permanent move to the frontiers of the Northwest Territories. Unfortunately, Matti's original response to this news was never recorded. Matti's family was socially prominent and included several members of Parliament and a Canadian Senator. The Rutherford family had continued with its tradition of dairy farming and the other children (Alexander's brothers and sisters) were well established in the Ottawa area. Alexander was very prominent in his church and in a number of service clubs as well as his Masonic Lodge where he served in a variety of offices including Worshipful Master. The local newspaper, The Kentville Advocate, devoted several articles that winter to Rutherford with special tributes and honours as well as the well wishes of many people as they were about to relocate. The young family was giving up much and assuming a great risk in their move to the west. 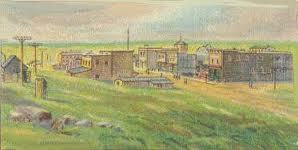 On June 10th, 1895, Alexander, Matti, Cecil and Hazel arrived in what was briefly known as South Edmonton. As they stepped off the train at the C & E terminus, a new chapter in the life of the Rutherford family and in the history of that part of the Northwest Territories had begun. A.C. Rutherford's contributions to the newly formed town of Strathcona, to Edmonton, to the Province of Alberta and to its first University are well known. His former residences have been preserved in both Fort Edmonton Historical Park and on the University Campus. 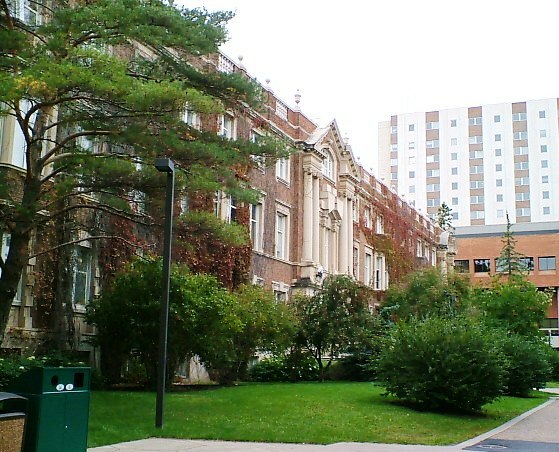 As was befitting his stature in the University and his lifelong dedication to youth and education, the Rutherford Library stands prominently at the centre of the University of Alberta. Masonically, Alexander C. Rutherford was a founding member of Acacia Lodge #66 G.R.M. He was installed as its first Worshipful Master on January 23rd, 1897 (a fourth Thursday) only 19 months after his arrival in the west. Obviously, his Masonic duties and love for the craft took a high priority in his life as he attempted to establish his family and profession in the new town of Strathcona. Following his rise to political prominence as Alberta's first Premier in 1905, we note that a private member's bill, passed in only the third sitting of the Provincial Legislature, was an act to incorporate the Grand Lodge of Alberta of Ancient Free and Accepted Masons. A.C. Rutherford served this infant province not only as Premier, but with the multiple portfolios of Provincial Treasurer, Minister of Education and significantly, in 1908, as Minister Responsible for Private Members' Bills, the ministry under whose jurisdiction fell the act that formed our Grand Lodge. A.C. Rutherford remained active in this his Masonic Lodge until his death on June 11th, 1941. Strathcona, Edmonton, Alberta, Canada, Acacia Lodge and Masons throughout this jurisdiction owe a great debt to this quiet and dignified gentleman of Strathcona ¬Alexander Cameron (A.C.) Rutherford. His dedication to the craft, combined with a spirit of adventure and the continual search for new challenges, present an inspirational example for all of us. We in Acacia are privileged to be members of this Lodge which he helped found and therefore, have a heavy responsibility of carrying on the traditions and spirit established a century ago just a few short blocks from here. It is my hope that as we celebrate our centennial in 1997, we are successful in having permanent displays of A.C. Rutherford's Masonic contributions established in his former residences, the Masonic buildings both here and in Fort Edmonton Historical Park as well as in the library which bears his name. This is the type of challenge which Rutherford himself would have met and which we in Acacia, should rise to. This paper was presented by Rt. Wor. Bro. Rod Ponech, District Deputy Grand Master of Lakeland District, G.R.A. on the occasion of his Official Visit to his mother lodge, Acacia #11, September 8th, 1994 AD, 5994 AL.